Saying marketers are a busy bunch would be an understatement. With digital marketing growing at a rapid pace, it’s hard to keep up with all these platforms, let alone personalizing marketing messages to every customer’s need. However, “lack of time” cannot be an excuse for you to send out an email newsletter that is engaging and at the same time, visually appealing. If you have ever used an email marketing service like Mailer Lite, you know crafting a perfect newsletter takes a lot of time and effort. Since more than 80% of users are expected to access their emails via mobile by 2018, making your newsletter mobile responsive becomes a necessity rather than a “this can slide”. With services like Mailer Lite, you have to deal with the formatting, decide which fonts to use, work with different image sizes and resolutions and sometimes, messy HTML code to make sure your newsletter looks perfect on all devices. Ugh! The only thing that will help you grow your newsletter is producing great content. And producing great content demands time. If you are spending the majority of your time making sure that your newsletter “looks” good, you are probably compromising on its quality. The greatest asset a marketer has is TIME. So it’s only logical to spend it wisely and on work that will provide the greatest returns. We decided to do something about this and came up with elink.io, a content marketing and curation tool that helps you focus on the most important part of your newsletter- content. The best part? You can completely change the look of your newsletter by switching between elink’s 19 different templates at any time of your newsletter creation process and see which one suits you the best! All the templates are responsive and look perfect on all devices. Let us give you a detailed walkthrough on how to create a newsletter with elink.io and export it to Mailer Lite. Elink offers over 19 responsive and visually appealing templates to choose from and make your newsletter stand out. The best part is, you can change the layout of your newsletter anytime to and pick the one that suits your design needs best! After publishing, go to your dashboard and select the newsletter button. Copy the HTML code and get ready to export your newsletter to Mailer Lite! 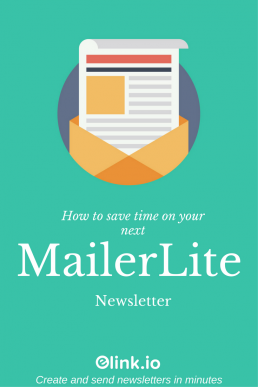 Export your newsletter to your Mailer Lite account! In your Mailer Lite dashboard, click on new campaign and select “your own HTML” option. Next, click on “paste in code” button to paste the HTML code from your elink.io newsletter. Paste your HTML in the editor. Your newsletter will appear on the left side of your Mailer Lite screen. Select your subscribers’ group and schedule your newsletter for takeoff! PRO TIP: If you don’t use Mailer Lite, you can still send out visually appealing newsletters using Gmail, Constant Contact, ActiveCampaign, GetResponse, or any other marketing service in minutes with elink.io! Great article! I’ve seen so many people recently confused or not sure where to start when it comes to making newsletters for their email subscribers. This will be a great recourse. Email newsletters have come a long way! Years ago I worked for a company that would send mailers on Wednesdays and all was fine until mobile and responsive design started to be a thing. I remember the developers trying to figure the responsive thing out, very messy indeed! This looks so cool! I’ve only ever used MailChimp, but this looks awesome! That elink tool is genius! I love Mailerlite for their services, but creating newsletters is definitely time consuming, and I don’t love the template I use right now. Definitely pinning this post so I have it the next time I go to create a newsletter.